Well, a lot has gone on lately. Just gonna briefly touch up on a few events. First off, who is spreading all the sickness??? I am hear to publicly request that you stop it...I am tired of all the sick people...in my house. With sick people comes a rare opportunity for me to stay home, I am indeed grateful for that. Staying at home is not a luxury I enjoy all the time, even when I'm home I'm working. So needless to say despite the decline in income over the last few weeks, I have enjoyed getting to know my "turf" again. So everyone got the flu...yes everyone, except Dad. Dad never seems to get sick except for headaches. So we had a week full of vomit, tears, coughs, belly aches, fevers, chills, dehydration and zombies. And of course this was spread out over the entire week, Gosh it would just be too easy to have everyone sick at exactly the same time. That would mean we would only have one day at the doctor instead of three and a few days of zombies instead of a week...funny how that works. So a few things we got done while reminiscing in our sickness. First things first, girls got pedicures. And manicures...been a long time and the five layers of touch up polish on my toes desperately needed to be removed and re applied. 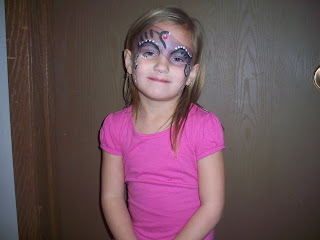 Taylor made it to a birthday party the week before. 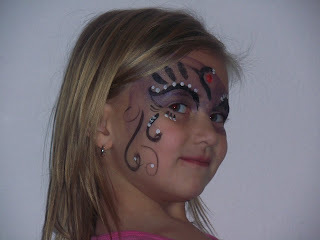 They did some fabulous face painting. She was way excited. I have taken the opportunity to cook while at home with zombies. I actually like cooking, it just seems like whenever I get a cool new recipe something comes up and I don't have time to cook it. Or kids always seem to desperately need my attention when dinner making time rolls around. Excuses I know, but anyhow I have made a goal to try cooking with something new every week...or so. There are so many products out there that I have no idea what to do with or how to cook with, so I have decided to expand my cooking horizon. This week I cooked a delicious recipe. It called for a Serrano hot pepper. I have never used one of these, in fact I have never heard of it. It was easy to find in the produce department. 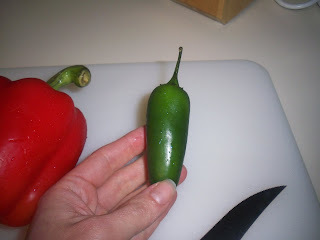 It looks like a mini jalapeno. It was delicious. This recipe also called for hoisin sauce. I have seen this around, but always strayed from using it because I was unsure of the taste. I used it and it was great. The recipe I used was an Indian and Asian dish. It was good, didn't take too long to prepare and I think I'll cook it again! Now off to the doctor, again. Presley has pneumonia and a wicked ear infection. Oh my goodness, where is the sunshine?? We are right there with you! Minus the throw ups this time, luckily. Hang in there! 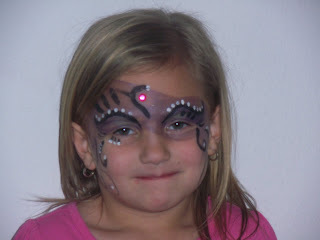 Love the face painting. p.s. we need to talk about pushing calories and you know its not for me!! I am sorry that you are having a round of the sicks. I hate when that happens. 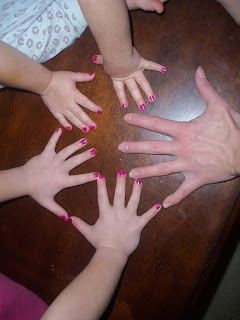 the nails look fab...the face painting is crazy! so artistic. I love new recipes! I have been trying to be better about cooking off my monthly menu. You should post your recipes and then I can steal them...did you see I am attempting to post my recipes? Love the toe and finger pics...hope everyone is better, you might have to share that recipe me...we need some sunshine too, ever so ready for the warmth!